“In 2001,” the entire island city-state of Singapore spontaneously “realised that the rest of Asia was starting to rival it for low-cost manufacturing and electronics, so prime minister Lee Hsien Loong announced that the way forward lay in nurturing its science. 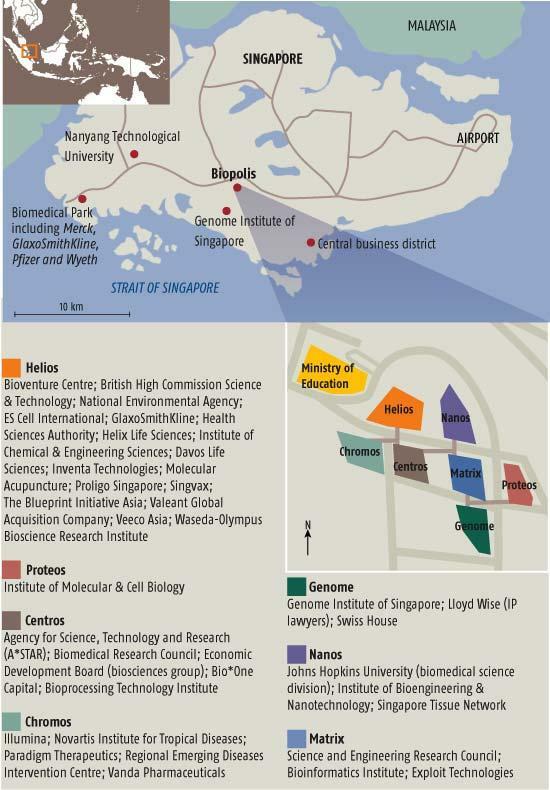 Hey presto, an R&D park called Biopolis was built and staffed within two years” – and it has some freaky building names, like “Proteos” and “Chromos” and “Nanos,” the latter of which houses the so-called “Singapore Tissue Network.” (They rent Meg Ryan movies together). [Image: From New Scientist, which is also the source of the quotation, above; click on the image for larger version]. A kind of Lonely Planet Guide to the world’s purpose-built bioscience cities. The Rough Guide to Biopolis. Written by BLDGBLOG. Dedicated to Ovid. Anyway, if you’ve got images… send ’em in. That first link, in the previous comment, should go here, to a page about OneNorth. Greetings from “Disneyland”… liked your coverage of London’s tunnels. Yes, Singapore is hyper-efficient, though the economic trendspotting is probably not as “spontaneous” as it might seem. It’s fantastic that there’re people talking about the lesser known projects in Singapore such as Biopolis and OneNorth. There’re now other projects as well in different parts of Singapore such as similar technology aligned areas in Jurong East and the one near Singapore Expo which are all geared towards the same purposes. Thanks for the exposure!